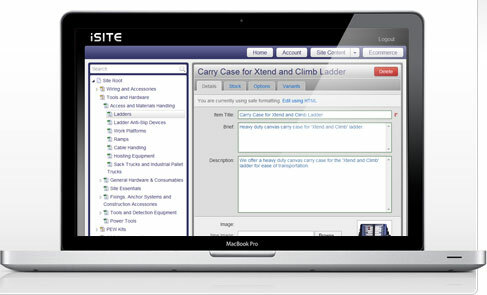 The iSITE system is an easy to use, cost effective yet powerful content management system for your business. E-commerce websites from just £10 a month! A lot of work goes into creating an effective bespoke website, trust us, we know! The iSITE system allows us to reduce the cost of developing your website by utilizing the best practices we've developed for Search Engine Optimisation, Accessibility and Usability across all of our customers - meaning you don't pay for it! An initial setup fee applies to each site. This includes an individual design and configuration. All iSITE's come with full on-line website statistics, free of charge. The iSITE system puts you in the driving seat of your website, but that's no use if you have to spend forever learning how to use it! Unlike other content management systems, with an iSITE you don't need to learn anything new. The iSITE system has been designed to grow with your business. From just £10 a month, even the smallest businesses can afford a basic site and once you're ready to start selling online, the iSITE is ready too. The iSITE system is one of the fastest and most powerful available. With it's easy to use on-line control panel you have full control over your sites content and images. This allows you to keep your site up to date at all times, ensuring customers get the information they need, when they need it! From a simple three page website to a full on-line store, the iSITE gets the job done! Tailoring your processes to the iSITE system saves you time and money, helping you get your business online, but we know that every business is unique. As your business grows we can add custom built services and software to meet your needs whilst retaining the solid framework of the iSITE system.